It is really an interesting story, just because we are in front of two absorbing stories: the one narrated in this book and the life of his author. As far as we can understand, this novel first published in 1930 has been translated only into Italian (Bollettino di guerra, Mondadori, 2008) and into Spanish (Parte de guerra, Sajalín editores, 2012). The vicissitudes of this book under an editorial point of view were basically ups and downs since the beginning, so no wonder that still today there is not a consolidated knowledge around Köppen and what is probably his most prominent novel. Actually there are many reasons to point out this title among the ones that today represent the literary main stream of that crucial five-year period. And all these reasons are firmly joined by the life and biography of Köppen. Edlef Köppen was an educated soldier and we all know the importance to analyze the boost toward the war and war's impact both on intellectuals and on the common infantryman. It's not a matter of discrimination of the two categories of soldiers, which entered and ended the war with different motivations and positions.Take for example the Italian case of Renato Serra and his peculiar interventionism in the long debate that came before the Italy's entry into the war in May 1915. And take the expetations and feelings of those thousands of men abondoning the countryside for the trenches. The studies of the First World War should one day treat the impact of the war on the these two clusters of combatants, before and after the war, because both human courses are extremely meaningful for a better understanding. 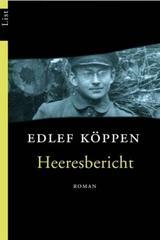 Secondly Köppen represents an almost unique case of a soldier fighting from day one to the end of the war. He was both on the West and on the East fronts. He got wounded in the Battle of the Somme in 1916 and the effects of the injury can be considered the cause of his early death in 1939, when he was almost 46. He knew what we call today the war insanity and was interned in a psychiatric hospital, when the war was close to an end. After the war, he was particularly active in the publishing and radio broadcasting industries. When in 1930 Heeresbericht came out, it only could be considered a menace by Nazi movement (this is the reason why the novel was sequestered already in 1933 for the its unfriendly contents and tone). The novel is built on an original frame and Köppen was able to wedge the fragmented reality of the war years into compelling stories: bulletins, speeches, pages of his diary coexist in one of the richest novel that the aftermath brought to light. The pioneering approach to narration, along with the outcomes of the New Objectivity of the Weimar years and its suffocated democratic wails, were the starting point of the journey of this unfortunate yet important First World War book.